The Martian book cover reimagined by ormanator; Ready Player One book cover. 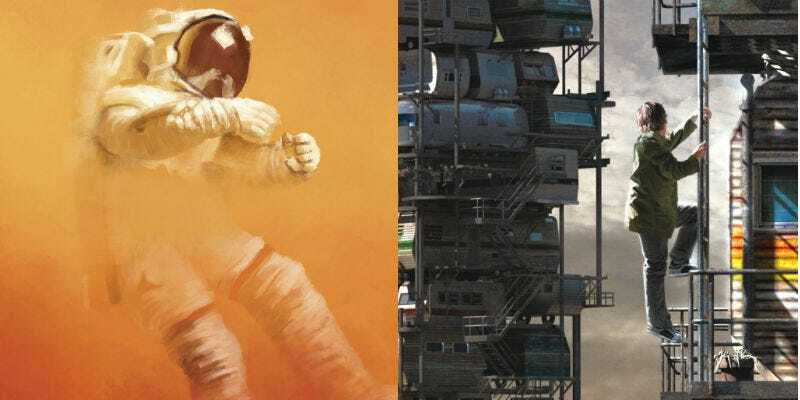 The Martian and Ready Player One are two of the most successful scifi novels of the past few years. Each will be, or has been, turned into a major motion picture, directed by Ridley Scott and Steven Spielberg no less. But The Martian author Andy Weir took their connection one step further. Last week on his Facebook page, Weir explained that he read Ernie Cline’s Ready Player One a few years ago and loved it. It inspired him to write a short story set in the world of the book, and post it to his own website. It was, for all intents and purposes, fan fiction. At some point—probably after The Martian sold a jillion copies—Cline read Weir’s story, and liked it so much he made it an addendum in a (now sold out) brand new signed, limited edition of Ready Player One. He then informed Weir that his story, titled “Lacero,” was now canon in the world of Ready Player One. You can read “Lacero” here—without spoiling too much, it’s a prequel/backstory for one of the novel’s more prominent characters—and you can read Weir’s explanation of how he inadvertently contributed to the Ready Player One universe on his Facebook page. *Correction: The edition this is in is actually sold out. We’ve updated our description.